2 Deluxe Vacation Rentals. 1 Beautiful Property. “The Lodge” has 3 bedrooms,sleeping loft, veranda and 2 huge bathrooms. Sleeps 2 to 8. It’s bright and spacious with excellent kitchen, laundry and extra amenities for children and the elderly. 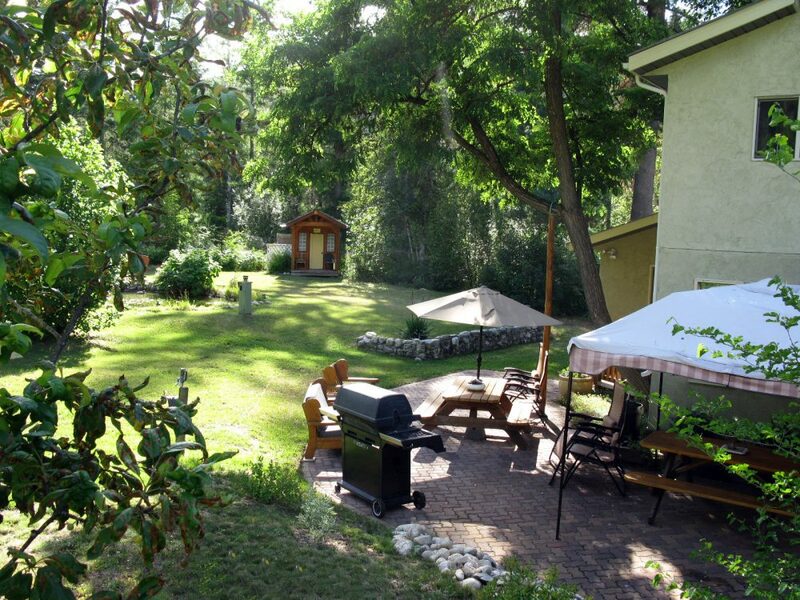 It has a large private fenced yard with a big brick patio, BBQ, waterfall, fish pond and flower gardens. It‘s Great for Groups! 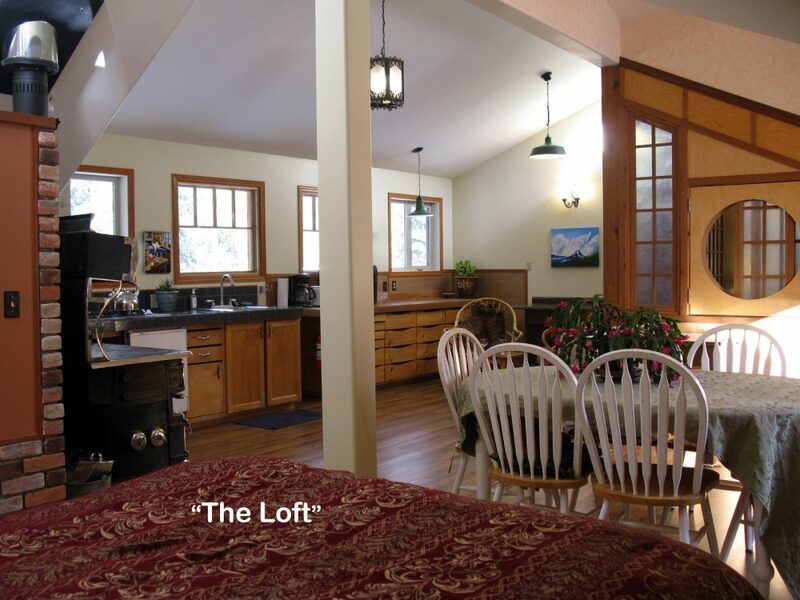 “The Loft” is a beautiful open plan suite that is perfect for a couple or small family. It has a gorgeous Japanese style bedroom, kitchenette, wood cookstove and bathroom. Sleeps 2 to 4. 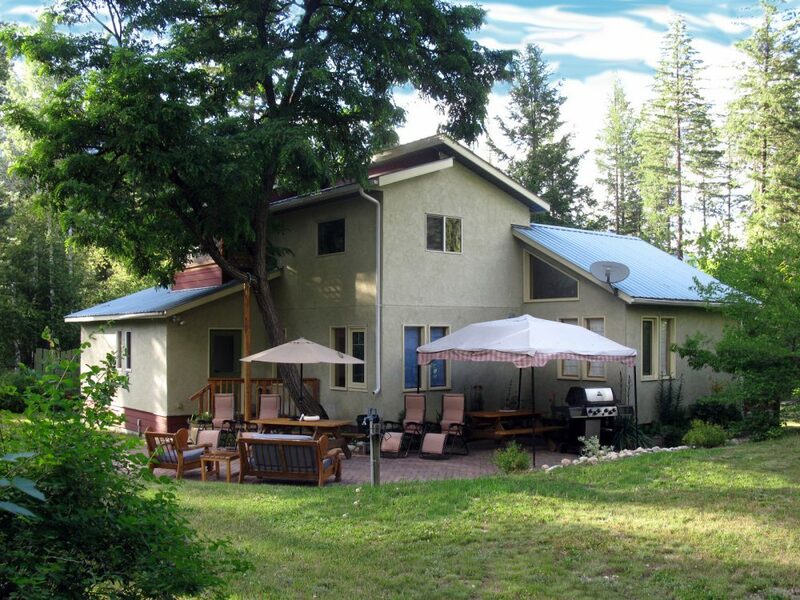 It’s a sunny space with high ceilings, artistic charms and forest views from the 2nd floor. It has a private entrance and small deck. It’s great for a solo retreat or family adventure. Check out our website! It has: slideshows of both rentals, rates, reviews, local information and an up-to-date availability calendars. 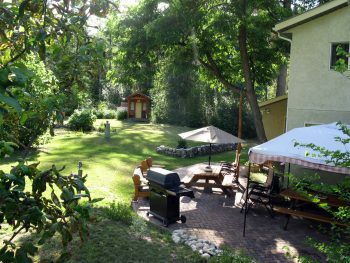 Located on a 3 acre forested setting in Winlaw at the center of the Slocan Valley. We live below “The Loft” and provide excellent service to our guests. We host small weddings and family gatherings and provide extra amenities for events. Our Lodge is wheelchair accessible with 1 huge bathroom, ramps, wide doors and more. Everyone is welcome at Paradise Valley Lodge! Phone ahead for an appointment. View our website for: Rates, Availability and Pet Policy. We require a 50% deposit to reserve your stay. We accept: Credit cards, E-transfers & cash. We have a 5 star guest rating. We're open all year.